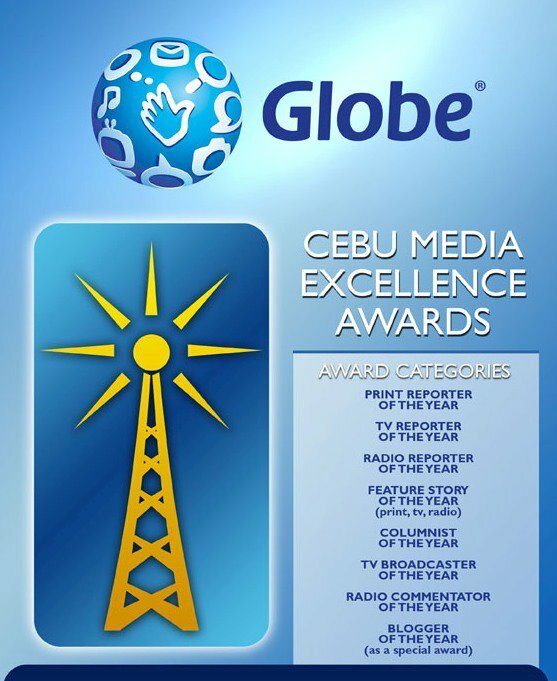 Globe Telecom recently announced the finalists of the first ever Cebu Media Excellence Awards. The first ever Cebu Media Excellence Award (CMEA) in celebration of the province’s Press Freedom Week. The CMEA is Globe’s way of paying tribute and giving recognition to print, broadcast, and digital media practitioners “who have excelled” in their own field. AND I'M ONE OF THE FINALIST FOR BLOGGER OF THE YEAR!!! WEEEE! Forty-nine (49) finalists have been chosen for 13 different categories that honor members of the media who have made a mark in the Cebu media scene. Categories include reporter of the year for radio, television, and print; feature story of the year for radio, television, and print; radio broadcaster of the year; blogger of the year; and columnist of the year. “We are very pleased and overwhelmed with the response to the first Cebu Media Awards. It was really a challenge as there are so many commendable entries that are worthy as finalists,” says Globe Corporate Communications Head Yoly Crisanto. For radio, Reporter of the Year category nominees are Astra Zina Logarta and Elias Bolonos, both from DYHP RMN Cebu. The Feature Story of the Year finalists, on the other hand, include three entries from Atty. Alan Piloton and Aida Tampus of DYHP-RMN’s Dream Ko Kalambuan Mo! program—‘Obra Negosyo featuring Leah Mayol’s Bibingka in Mandaue City, Obra Negosyo Eskwela‘, ’Career Guidance, Ongoing Skills Training thru TESDA with Sec. Joel Villanueva‘, and ’DMDP available programs and career guidance with DMDP Chief Fidel Magno‘. Nominees for the Broadcaster of the Year category include Atty. Ruphil Bañoc of DYHP RMN Cebu, Juril Patiño of BOMBO Radyo, and Mars Mosqueda Jr. of DYRC. For television, Reporter of the Year contenders include Patricia Andrea Patena of TV 5 and Alan Domingo of GMA 7. Domingo has also four entries in the Feature Story of the Year category namely Education, Balik Eskwela, Baha, and Modern Human Trafficking. Blogger of the Year finalists are Vernon Joseph Go (vernongo.com), Jaysee John Pingkian (jaysee.me), Narciso Tapia (cebumd.com), Bert Padilla (cebutechblogger.com), and Nancy Cudis (nancycudis.com). For print, Reporter of the Year finalists include Mia Abellana-Aznar and Katlene Cacho of Sunstar Cebu (Business & Entrepreneurship Category); Bernadette Parco and Princess Dawn Felicitas of SunStar Cebu, Cris Evert Lato of Philippine Daily Inquirer, Marian Christie Codilla of Cebu Daily News, Brenda Batuto of Banat News (Environment and Disaster Response); Princess Dawn Felicitas and Jujemay Awit of SunStar Cebu, Carmel Loise Matus, Candeze Mongaya, and Ador Vincent Mayol of Cebu Daily News, and Lesley Vestil of The Freeman (Governance and Social Progress); Katlene Cacho and Mia Abellena-Azar of SunStar Cebu, and Ador Vincent Mayol of Cebu Daily News (Information and Communications Technology); Rebelander Basilan and Jujemay Awit of Sunstar Cebu, Sanden Anadia of Banat News, and Ador Vincent Mayol of Cebu Daily News (Youth and Education). Feature Story of the Year finalists are ‘Outbreak: Stemming the Tide of AIDS’ (3-part feature) and ‘Waterless, Watershed, Wastewater, and ‘Lives on the Line’ by Linette Ramos, Bernadette Parco, and Cherry Ann Lim of SunStar Cebu; ‘Betrayal of Trust’ by Bernadette Parco of SunStar Cebu; ‘Special Report K to 12: The Longer Journey Begins’ by Michael Angelo Gallego, Junapril Dayao, Jeffrey John Bungcasan, and Joannes Sima Vale of The Freeman; and ‘Puso: More Than Hanging Rice’ by Marigold Lebumfacil of The Freeman. SunStar’s Erma Cuizon, Juan Mercado, Bong Wenceslao, Mayette Tablada, and Melanie Lim are all for the running for Columnist of the Year category. Punongbayan & Araullo (P&A), the auditing firm of the Cebu Media Excellence Awards validated the list of finalists. The awarding ceremonies of the Cebu Media Excellence Awards will be held on September 18 in Casino Español in celebration of the Cebu Press Freedom Week.